Colorado fall, 2016 | ride. travel. live. This year’s trip took place September 23-24, as I drove with a friend to the San Juans, looping counterclockwise starting in Durango. The trip coincided with a rather cold system that dumped a rather unexpected amount of snow (up to 2 feet in places) and left many areas 9000 feet and above with a coating of white. 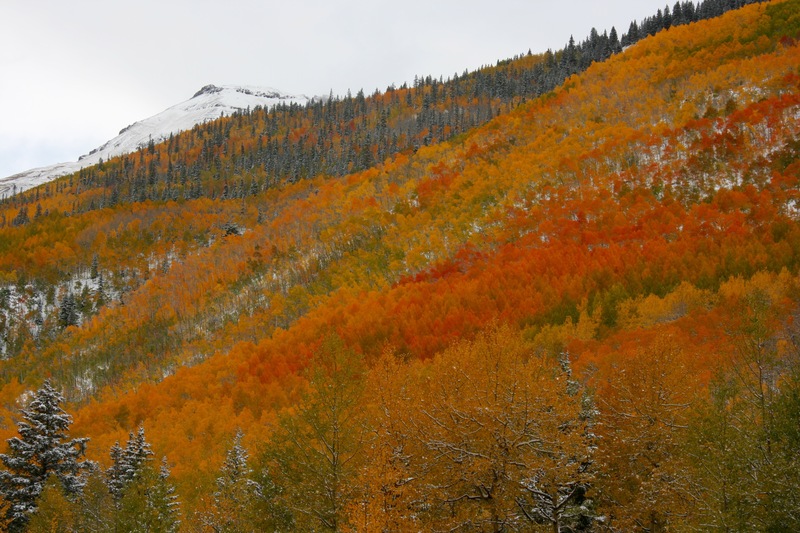 US 550 tends to see different peak times depending on the aspect and elevation, but in general the area between Red Mountain Pass and Ouray is at its peak in the last week of September. We lucked out, while it was a rather gloomy, blustery noon hour in Durango where we had lunch, the skies gradually cleared such that by late afternoon, it was a beautiful mix of snow, clouds, sun, and foliage. I was told by the owner of a jeep tour operation in Ouray that this is a once in a decade kind of scene. We continued over to Telluride the following morning, via the always spectacular Dallas Divide. 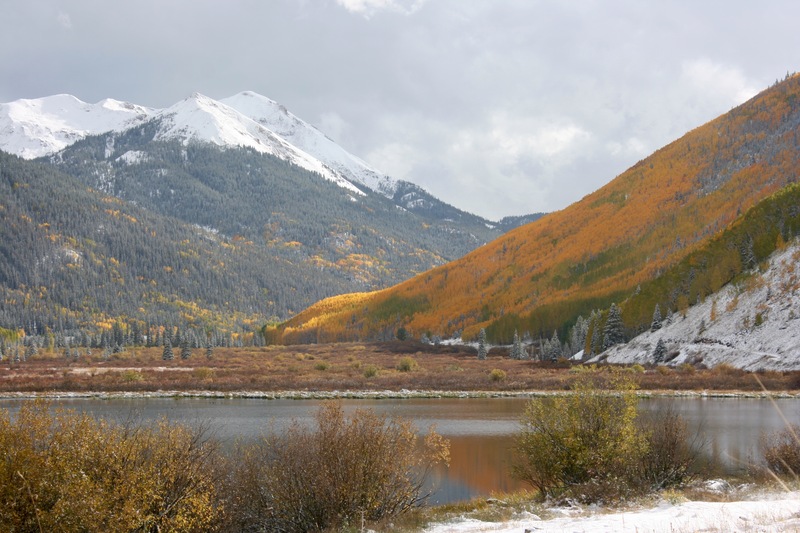 Dallas Divide is relatively low in elevation, just shy of 9000 feet, and tends to peak in early October. It’s best when there’s a bit clearer weather and Mt. Sneffels is visible, but the morning was pretty cloudy. 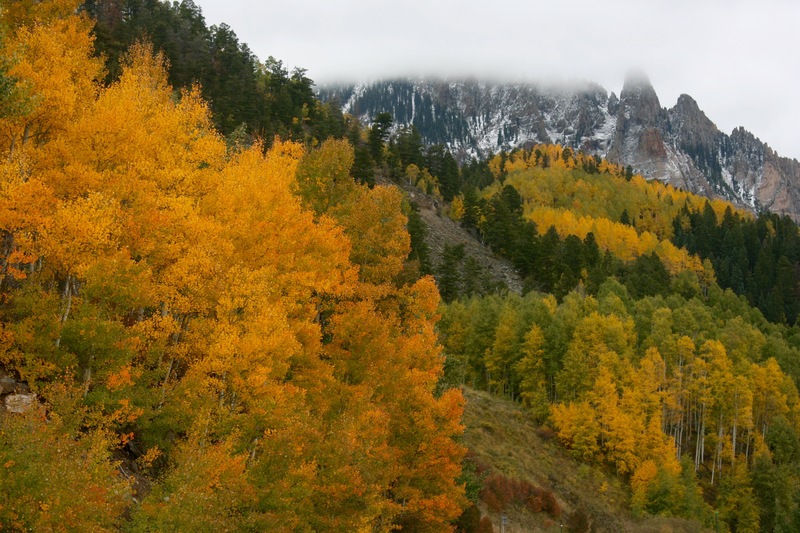 In Telluride the weather was similar, with only rare peeks of sun- the leaves were slightly before peak, probably around a week early in town and along the road up to Lizard Head Pass. The top of the gondola station was awfully chilly, probably slightly below freezing, but with socked in clouds and general dampness, which made it feel even colder. By the time we reached Dolores, it was sunny and quite warm. 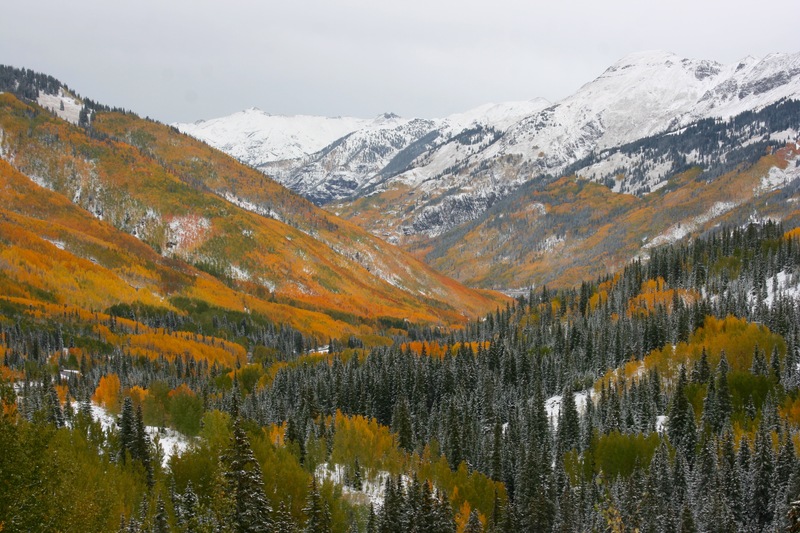 I’ve made regular posts about fall in Colorado over the past few years, generally with dates on the photos, so hopefully you can get a better idea about when to visit.